Tony is married to Nicole and they have two children Noemi and Lucia. Although born in Hertfordshire his parents are from Galicia in the rugged North west Coast of Spain. Many visits here as a child have developed his love for travel, the outdoors, good food and spending time with family and friends. Aside from dentistry Tony is a passionate golfer and enjoys running and hiking. One of his favourite trips was climbing Mount Kilimanjaro which he did with his wife, helping to raise money for local communities in Tanzania. Dr. Tony Aneiros qualified with honours from The Royal London Dental School in 2004. Having achieved distinctions in all 5 years of the Bachelor of Dental Surgery he was nominated for the Gold Medal award of the University of London. Since qualifying he has lived and worked in Essex and has gained experience in all fields of general dental care with a special interest in aesthetic and implant dentistry. He has achieved the Postgraduate Certificate in Dental Education at Bedfordshire University and was awarded the Diploma of Membership of the Joint Dental Faculties (MJDF) of the Royal College of Surgeons of England. Tony is a mentor to other dentists and has been a Foundation Dentist trainer with the South East of England Health Authority, a position which demands demonstration of advanced experience in modern dentistry and an ability to teach newly qualified dentists safe, predictable and professional care to the highest standard. He has an established reputation for his caring nature and ability to treat nervous patients with an informative, tailored and gentle approach that prioritizes patient needs. He has a thorough understanding in Dental Implant Treatment having completed a Masters Degree in Implant dentistry at the University of Bristol, travelled internationally to develop his skills and has been helping patients to smile more confidently and eat comfortably with dental implants for over 10 years. Tony loves to help patients through their journey to a healthy happy smile with the use of photography and study models so that patients can visualise and be a part of the planning experience for treatments ranging from a single tooth to a bespoke new smile. Since 2007 Tony has been providing cosmetic teeth straightening using clear, fixed and hidden orthodontic systems to help patients say farewell to twisted teeth. With advanced training in cosmetic bonding, whitening, veneers, crowns and bridges you can expect a comprehensive whole mouth health approach as well as a beautiful long lasting result. 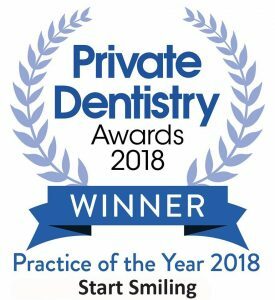 Dr Tony believes that his patients should have the best that modern dentistry has to offer and has invested in his training and cutting edge dental technology and materials at Start Smiling. Today patients can get more out of dentistry and have their smiles transformed in a gentle comfortable manner often with no drilling or injections and fewer appointments. We can make a visit to the dentist a positive, pain free experience and transform how you feel about your teeth. We will listen to you without judging and help develop a long trusting relationship. It’s amazing how a confident smile can change a patient’s life and we see it every week.